“Alligators and Me: My Life in Alabama 1968” by Molly Milner is one of the more fascinating books I have read about living in the south during the time of civil unrest, racism, KKK and the fact that women were subservient to their husband regardless of their own wishes. Molly’s husband is called upon to serve as a new pastor in an all-black church in Mobile. Molly was raised in a strict Baptist family and for her to marry a Lutheran man and move from the safe environment of Ohio and her family to the south is not only a cultural shock for her, but she finds that what she thinks and feels is no longer important to her civil rights activist husband, Ned. What drew me most to this story was the honesty and openness that Milner describes in both the dismissal of women, and the treatment of black lives in the south. Many think that living in the south is all warm, friendly and all thoughts of slavery and racism are long gone. The wide range of emotions the author feels are some of the same emotions I experienced as a military “dependent” when my husband had to give me permission to take classes, get an identification card, and expected me to play hostess to women who could care less about me. I loved the fact that regardless of the obstacles Milner came across, she persevered to stay true to herself while at the same time learning how to make those obstacles work for her. As a former school teacher, I was also impressed with how determined Molly was to get a teaching job, even if she was the only white person in the school. Sometimes one can learn a lot from students who are not trusting of adults who are of a different race or culture, and that in itself is a gift. Life in the 1960s in the south was a tough go for those who were not of the right color, and one’s life was always on the line. Milner did an excellent job of describing numerous events and feelings of unrest at that time. 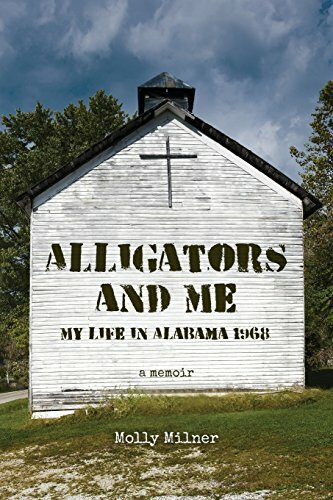 “Alligators and Me: My Life in Alabama 1968” by Molly Milner is a book I highly recommend to all readers.